I love this display in the Duane Reade on 71st Continental. 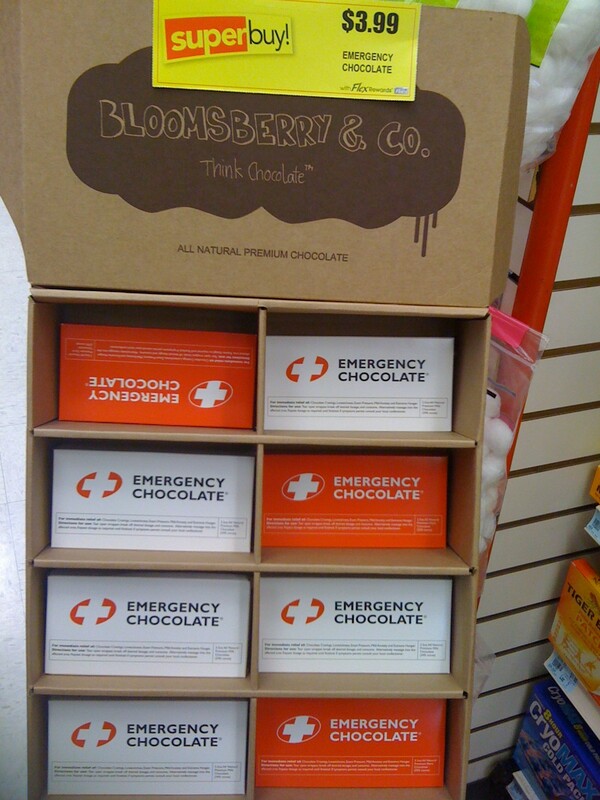 Emergency Chocolate! Now, is this just for that desperate craving or should we stock up on it for that overdue hurricane? Guest Who’s Buying an Aspirin? 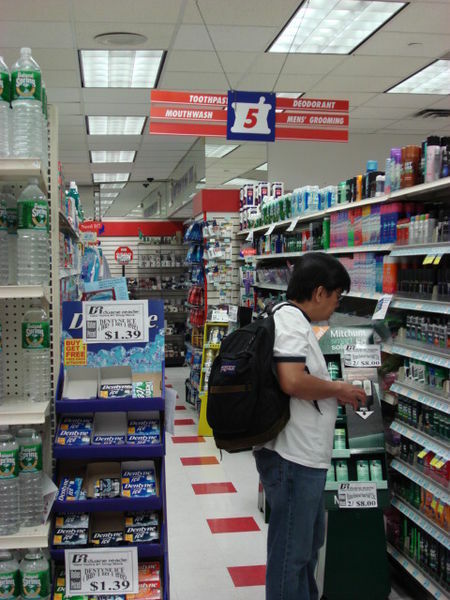 What’s with the cashiers at Duane Reade calling the customer “guest” all of a sudden? I’m not checking in for an overnight stay, am I? Beware of the Line Storms!! I was in Duane Reade the other day and the term “Line Storm” just popped into my head. I am sure you all know what I am talking about. A Line Storm is the inexplicable way you can walk into a Duane Reade one moment and see absolutely no one on the line, and your heart just jumps for joy, maybe even skips a beat you are so excited. You progress forward, after several minutes of disorientation you find the products that you need. You rush back to the front of the store… only to find like ten people on the line. You have been hit by a Duane Reade Line Storm!! Chances of Survival: Excellent. Chances of Despair: 100% ! Anybody else completely baffled by the new Duane Reade loyalty card program? The old one was so simple to use and easy to understand. But this new Flex Rewards one has me completely thrown off. I’m not one to spend a lot of time clipping coupons (in fact, I rarely have ever done that), but I usually join the loyalty programs at places I frequent a lot, like Duane Reade. They’re usually easy as hell to use and they can really pay you back. Like the movie theater one’s – if you haven’t joined those you don’t know what you’re missing. For no annual fee, nada, I seem to get something free pretty much every time I go to one of the theaters – candy, popcorn, soda and sometimes a free movie entirely! Now back to Duane Reade – the previous dollar rewards or whatever they called that program was a really good one. I seemed to get some money off every few trips to the store. With the new one, I swear I had racked up this nice balance and was getting closer to some money back, and then when I bought something this weekend, that balance had just disappeared and been reset to zero. I admit, in my harried life, there’s a chance I did not notice when I got the redemption. But if I did miss it, then what kind of reward program is that if they don’t somehow make sure you’re aware of it when you’re getting it? And also, what kind of reward program is it if, even after asking different cashiers to explain it to me two different times, and reading the little booklet they gave me when I signed up, and then just checking out the website a few minutes ago, I still for the life of me can not remember how many points I need to accrue before I am rewarded for shopping at Duane Reade.